"It became an obsession," Tostado said over the phone. "Every day I would think about catching it. I’ve actually hooked her three times and Todd's hooked her once. We've come close a couple times, but every time it would be a battle and she'd get away." But last Saturday, the two men were fishing (with Wonder Bread as bait) at their usual spot near 3900 South when Sally showed up. "She jumped out of the water and you could see the scales, we knew it was Sally," recounted Tostado. "Todd hooked her and pulled her in while I grabbed the net. It took all of my strength to get it on shore." Tostado with Sally. No doubt he's singing this. Photo by Cleveland. After a good 20 minutes of struggle, the two men landed the fish, snapped a few photos and tossed her back. "I've caught 14-pounders out of there for years. Todd's caught a 16-pounder and now we finally got Sally." Though catch and release is a humane way to enjoy the sport, the Jordan River is plagued with a number of invasive species that authorities are desperately trying to remove, including European carp like Sally. European carp were first introduced to Utah Lake in the early 1800s as a sustainable food source, but over the years they've become a burden to the local ecosystem. Efforts are currently underway to remove more than 40 million pounds of carp from the lake. But, as Sally has proven, the carp are also affecting Utah Lake's primary outlet, the Jordan River. 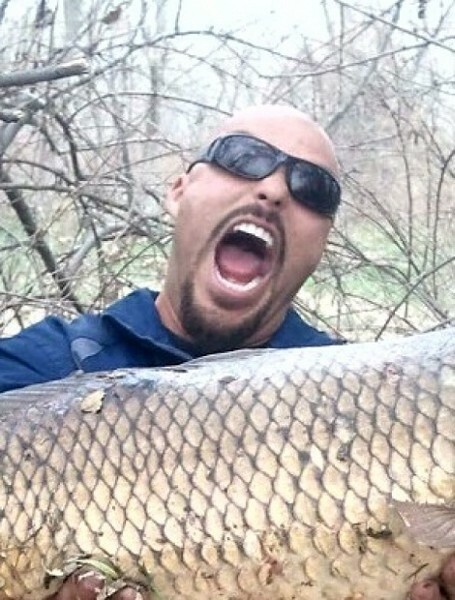 "It's not just carp, we've found quite a few odd species in that river," says Drew Cushing, Warmwater Sportfish program coordinator for the Utah Division of Wildlife Resources. "red shiners, fathead minnows, northern pike, pumpkinseed fish, talapia, painted turtles, snapping turtles, weather loach and at least two alligators have been pulled out of the Jordan River. Plus the occasional piranha. We've documented 50 illegal introductions since 2000 and that’s very troubling." When asked why Utahns don't just flush their unwanted pets down the toilet like normal people, Cushing explained, "I think some of these species might be resilient enough to actually make it through the toilet. Look, when you have two million people living in the valley here, it doesn't take many of those [invasive species] to make an impact for us. Every year this problem seems to be getting worse and worse." Super-carp? Alligators? Pissed-off toilet fish? It wouldn't be at all surprising to find out the Jordan River is infested with shrieking eels. So, what do you do if you come across something weird in the South Jordan River? "Don’t throw it back. Try to keep it alive and give me a call," Cushing says. "At least take a picture of it. We like to see it, handle it and find out if it’s a threat." As for freakishly-huge European carp, they're considered "trash fish" and it is encouraged to remove them completely from the ecosystem. Or, if you're a softy, you can always just toss 'em back. "I've been doing this for years," Tostado says. "It’s my favorite thing to do, so I don’t want to kill 'em." 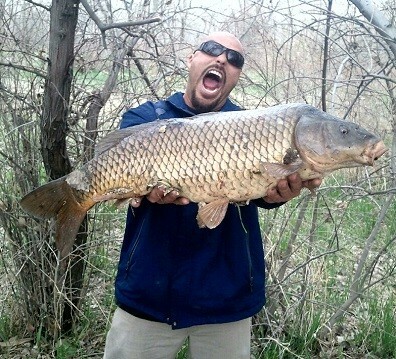 The current record for carp caught in Utah is held by Stephen Shemenski, who bagged a 30-pound, 4-ounce carp on the Willard Spur in April of 2012.